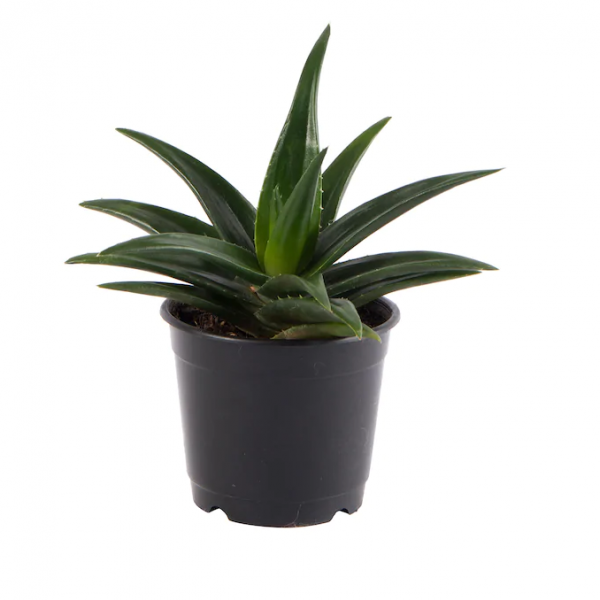 Spider Aloe is a small Aloe that forms dense clusters of small 8 inch wide stemless rosettes with 4 inch long by 1/2 inch wide incurved triangular shaped leaves. The leaves have long soft white marginal spines and a gray-green waxy surface covered with irregularly spaced bumps (tubercules). A foot tall flower spikes appear in late winter to spring, bearing about 20 pendulous 1.5 inch long red-orange flowers. This Aloe is drought tolerant with little to no irrigation required and is best when sheltered from getting overly wet in winter. Native to South Africa, Spider Aloe has undergone many different names including Aloe subtuberculata, Aloe suberecta, Aloe tuberculata, Aloe incurva, Aloe acuminata, Catevala humilis, Aloe perfoliata var. humilis and Aloe echinata. The species name humilis means 'low growing', refering to the plant's growth habit.